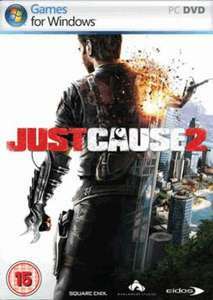 Go to this URL, select the download version of Just Cause 2 not the boxed one. At checkout use this code. Once you get the purchase to go through you are given a steam key to activate. I had a bit of trouble getting the purchase to go through as a guest but once I created an account it was fine and shows in my account history as £0.00. Steam redeemable code will be given to you immediately on the confirmation page, and a short time later via email too. Just Cause 2 is Windows Vista / Windows 7 only. This works for all sub-£5 titles, both new & preowned physical copies for PS3/350/PC and PC downloads. However I'm certain that all orders involving physical copies will be cancelled tomorrow. So just stick with the free digital downloads. Just to confirm, I have my key, it works on Steam, I have confirmation email from Gamestation saying £0.00 and also in the "my accounts" section of their site this is showing as £0.00. Oh that is why I couldn't get it to work, need an account eh? Bought the DVD version for 99p. No loss, I prefer physical media. How long does the email take? They've caught on now I think. It's all over. Really? I just got it free 60 seconds ago! Got through to page with place order button and it doesnt let me proceed, keeps reloading. Got through to page with place order button and it doesnt let me proceed, … Got through to page with place order button and it doesnt let me proceed, keeps reloading. You have to create an account & add a payment card; you can't do it as guest. Need to add payment details to get it to work. But I don't think it's working anymore as I gave it another go. Need to add payment details to get it to work. But I don't think it's … Need to add payment details to get it to work. But I don't think it's working anymore as I gave it another go. Might also need to change your IP address to redeem the code a 2nd time? You have to create an account; you can't do it as guest.I also associated … You have to create an account; you can't do it as guest.I also associated my elite card, and added a payment card.Don't think either of these is necessary for it to work though. Although it's free, you'll need to set-up an account with Gamestation BEFORE placing the order. You'll also need to add a payment card to the account/order even though it cost nothing. I'd have to enter a payment card but I don't really want to incase they take the £5 after they figure it out, do you think they would? Finally worked after adding payment info!! I'd have to enter a payment card but I don't really want to incase they … I'd have to enter a payment card but I don't really want to incase they take the £5 after they figure it out, do you think they would? worked for me 5 mins ago. code is correct, just remove any white spaces. didn't have to create a new account. this should make up for the countless cancellations i received from gamestation. You need to put your card details and it'll work. I want my vote back then. This deal is ****. worked for me, thanks guys ! Worked perfectly for me, website feeling a little sluggish though! Thanks for this!!! Working for me, typed in CAP'S! Anyone know if this Activation Code Has an expiry date? ?